Welcome to the first project progress bulletin. The project commenced on 1 February, and this bulletin provides an update on the progress to date. I will continue to share updates as key milestones are reached. It is an honour and a privilege to be a NCSEHE Research Fellow. The journey thus far has been truly rewarding on many levels. I wish to express (again) my sincere gratitude for this opportunity. 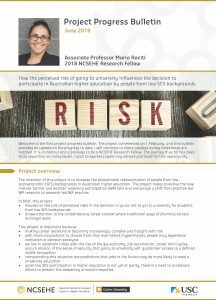 The intention of this project is to increase the proportional representation of people from low socioeconomic (SES) backgrounds in Australian higher education. The project hopes to evolve the now mature ‘barrier and enabler’ widening participation (WP) lens and encourage a shift from practice-led widening participation research to research-led widening participation practice. given low SES participation in higher education is not yet at parity, there is a need to accelerate efforts to prevent the deepening of social inequities.